"No.125.-View on the Genesee River, Portage, near New York." 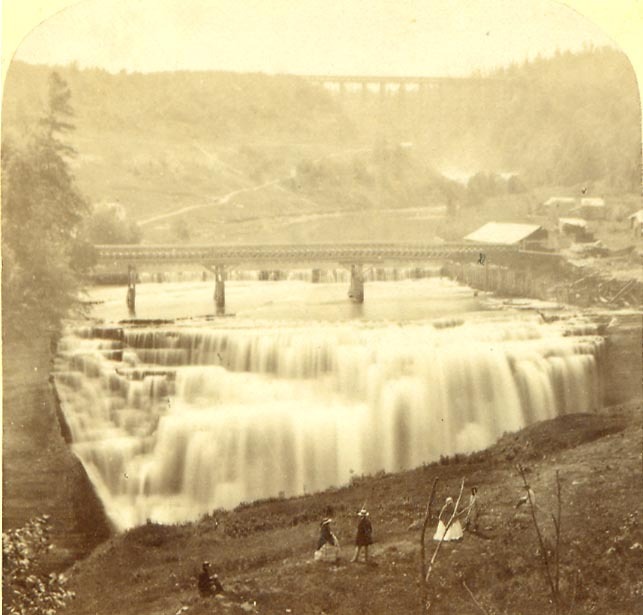 This early image of the Middle Falls area comes from the time that Mr. Letchworth made his first land purchases in the Genesee Valley. The photographer stood on the west bank of the gorge and took this image with tourists in the foreground enjoying the beauty of the Middle Falls. In the background you can see the mist of the Upper Falls and the outline of the famous Portage Bridge. Text: "The Genesee river steals and tumbles through the lawns and ravines of this region in a very wonderful way. At Portage it enters a grand rocky defile, and in passing forms many a superb cascade. As it rushes beneath the great bridge (in the extreme background of the picture) it makes a bold descent of forty feet. A quarter of a mile northward is a second cararact of 80 feet. A mile and a half still lower is the third cascade of 60 feet. Indeed, the whole of this region abounds with the most charming gorge and cataract scenery." This image is shown in Darrah's World of Stereographs p 33. See Image 38 for a similar view and additional information on the Lattice Bridge.